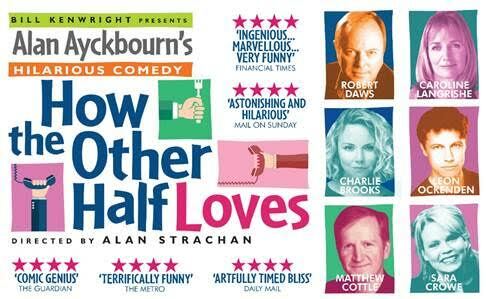 Direct from a highly celebrated extended season in London’s West End, Bill Kenwright’s production of Alan Ayckbourn’s farcical tale of matrimonial mishaps, How the Other Half Loves will run at Glasgow’s Theatre Royal from Monday 18-Saturday 23 September 2017. How the other Half Loves was the first of Ayckbourn’s plays to be staged on Broadway and the star cast of this production includes leading stage and TV actor Robert Daws as ‘Frank Foster’, best known for the hit series’ The Royal, Outside Edge and Roger Roger opposite Caroline Langrishe as ‘Fiona Foster’ who starred in Lovejoy, Holby City and Judge John Deed. Charlie Brooks, much-loved for her portrayal of EastEnders’ Janine Butcher performs as ‘Teresa Philips’ with Leon Ockenden, best-known for his role as Coronation Street’s Will Chatterton as ‘Bob Philips’. Matthew Cottle who reprises his critically acclaimed West End performance as William Featherstone, best known for the BAFTA-nominated Game On. Alongside him will be Sara Crowe as ‘Mary Featherstone’, who’s West End credits include Alan Ayckbourn’s Absurd Person Singular and The Constant Wife but perhaps is best known for her role in the popular film Four Weddings and a Funeral. An extraordinary success on opening in the West End in 1970 at the Lyric Theatre, How the Other Half Loves ran for a staggering 869 performances, delighting critics and audiences alike. 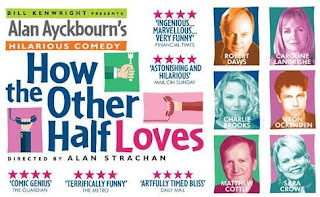 Fondly loved and considered one of Ayckbourn’s most popular plays; How the Other Half Loves received its first major West End revival in 2016, where it once again thrilled audiences. Originally opening at the Theatre Royal Haymarket followed by an extended run at the Duke of York’s, it will now be delighting audiences across the UK.